Timelessly elegant, this exqusite 18ct white gold wedding band from the Vera Wang LOVE Collection is set with alternating diamonds and the signature stone of the collection, blue sapphires.A beautiful piece to commemorate your marriage. Vera Wang 18ct white gold diamond & sapphire wedding band is rated 4.5 out of 5 by 2. Rated 5 out of 5 by Anonymous from Stunning, elegant with a touch of sparkle Beautiful vera wang ring to compliment the matching engagement ring. It sits beautifully under the pear shaped engagement ring and enhances the secret sapphires. 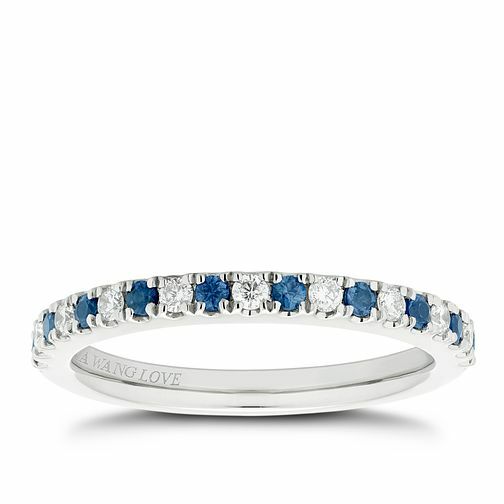 The ‘something blue’ sapphires make the ring extra special.